SIMPLE SETUP - The all-in-one, 360° camera, mics and speaker works with all popular web-based conferencing platforms. The Owl also receives automatic software updates with new and improved features. INTELLIGENT SOFTWARE & DESIGN - The magic is it's intelligent software that provides a panoramic view of the room and automatically focuses on the most current speaker. EXCEPTIONAL AUDIO & VIDEO - Remote attendees need full context of the conversation in order to truly participate. The Meeting Owl has an 8-microphone array and a custom designed single lens solution to provide the unique experience. OPTIMIZED REMOTE EXPERIENCE - What makes the Meeting Owl different is the remote attendee experience. No need to ask someone to turn or move the camera. The view shifts for you so the remote person always has a close up of the conversation. ENABLING EFFECTIVE COLLABORATION - Departments who benefit from the Meeting Owl most are collaborative teams: engineering, product, marketing and design. These groups value work flexibility and need to collaborate frequently to do their jobs well - no matter where they're located. 360 DEGREE VIDEO & AUDIO - The 360 degree lens allows the Owl to see in all directions at the same time while an 8 microphone array ensure everyone within 12 feet can be heard. 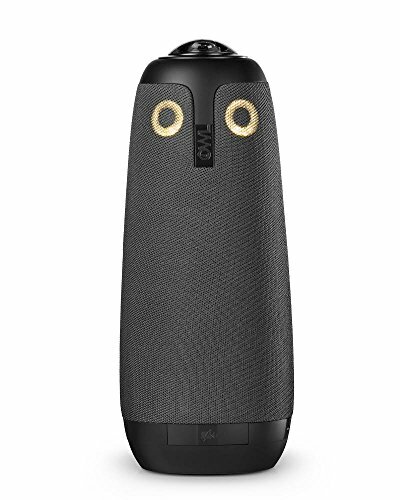 AUTOMATIC SPEAKER FOCUS - The Owl automatically highlights up to 3 speakers at a time. Dynamically shifting from speaker to speaker as the conversation moves, it provides a unique, inclusive remote experience. PLUG-N-PLAY - No software downloads necessary. Plug the Meeting Owl's USB 2.0 cable into your computer, and it works seamlessly with all major video conferencing platforms. ALL-IN-ONE - Combined video & audio simplifies your meeting room by reducing the number of devices needed. If you have any questions about this product by Meeting Owl by Owl Labs, contact us by completing and submitting the form below. If you are looking for a specif part number, please include it with your message.